The Unassuming Economist | Gloom & Doom … or Boom? 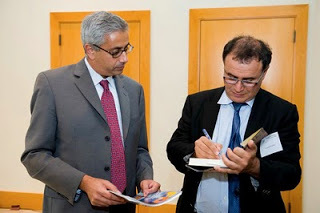 In a talk at the IMF, economists Nouriel Roubini (a.k.a. Dr. Doom) and Mark Zandi were pessimistic about the near-term economic outlook but split on how things might look a couple of years from now. There is a 40 percent chance of a double dip recession in the United States and some other advanced countries, according to Nouriel Roubini, chairman of Roubini Global Economics and a New York University professor. He cautioned against reading too much into recent improvements in economic indicators for Eurozone countries, quipping that “people are getting cheerful, but the best is behind us.” Mark Zandi, chief economist of Moody’s Analytics, matched Roubini in gloom about the near-term outlook, putting the odds of a double dip recession in the United States at 1 in 3. Despite these policy successes, though, the problems that precipitated the Great Recession were severe enough that the growth outlook for most advanced countries remains tepid. Governments are running out of policy options to keep stimulating the economy, Roubini said. And while emerging market economies were in better shape, these economies are not yet powerful enough to act as a locomotive for growth in the advanced countries. Zandi added that the growth expected in the near term is “not going to be enough to forestall increases in unemployment” in advanced economies; he predicted that the U.S. unemployment rate would be back in the double digits over the next few months. What could be done to improve the outlook? Roubini and Zandi agreed that a robust recovery would not take place until households, particularly in the U.S., are able to reduce their mortgage debt burdens and establish a more secure financial footing. Roubini said a nationwide write-down of mortgages would be preferable to cumbersome case-by-case loan modifications which would clog up bank offices and bankruptcy courts for years. Banks could be partially compensated for the write-down by warrants that would give them a share of profits from any eventual sale of the homes. Despite sharing Roubini’s gloom over the near term prospects, Zandi held out hope that U.S. prospects would get better by 2012. He pointed to two reasons for hope. First, households are slowly but surely cutting back on debt, and setting the stage for when they will feel comfortable enough to spend again. Second, corporate profits are surging and these have historically been a good predictor of job growth. He predicted that U.S. real GDP growth would be 5% in 2012. If U.S. growth in 2012 turns out to be 5%, Zandi will surely be invited back to the IMF to do a victory lap (see his presentation). ﻿﻿To see the video of the event, click here.